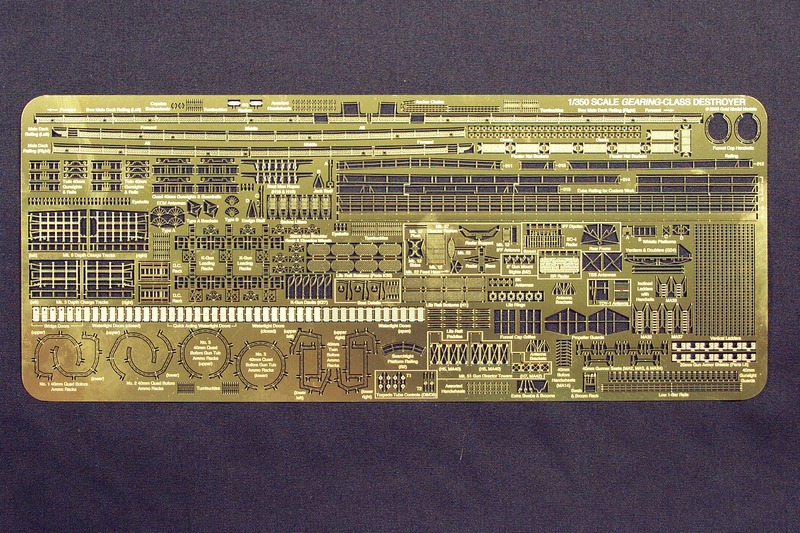 This set is designed to precisely fit the Dragon 1/350 scale kit of the World War Two U.S. Navy destroyer USS Gearing (DD-710) and its sisterships. A number of alternate fittings such as depth charge tracks and other parts are supplied. You will have some parts left over when your project is complete. Included is a full set of custom-fitted and pre-shaped main deck rails with integral netting and correctly positioned chocks. Also supplied is a set of custom-fitted 01 level rails. Additional railing sections in several styles are provided for custom work including simulated canvas-covered rails and tapered rails for the aft funnel platform. Other items furnished include vertical and inclined ladders, depth charge tracks and stowage racks, K-gun loading racks with handling davits, 40mm and 20mm anti-aircraft gun details, 5" gun captain sights, pre-shaped ready ammunition racks for all 40mm gun mount tubs, propeller guards, anchor chains, jackstaff & flagstaff, funnel cap grilles, funnel cap handrails, whistle platform & rails, floater net baskets, boat details, see-through bottoms & paddles for all life rafts, mast & yardarm details, Mk. 12, Mk. 22, SC-4, SR, and SG radars, ECM antennas, three fold-to-shape see-through director towers, two sets of torpedo tube control stands, antenna brackets for funnels & superstructure, Stokes litters, watertight doors, swab & broom rack with extra swabs & brooms, turnbuckles, eyebolts, life rings, capstan brake wheels and assorted control wheels.